British troops at the Somme are attacking again. Their target now is the village of Guillemont. The attack appears to start off well. After an artillery bombardment the infantry move forward. The British are aided by misty weather conditions, which hide them from the enemy. They manage to overrun the village. But then when the mist lifts, things go wrong. 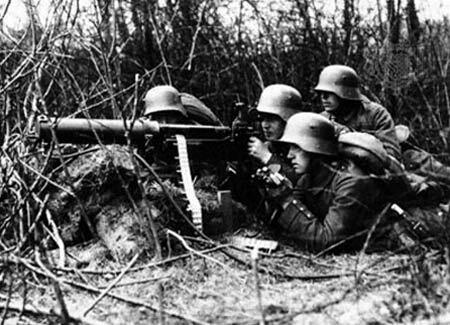 German machine-guns open up on their flanks. German troops emerge from the cellars of the village to attack them. The British are driven back with heavy casualties. The strength of the German machine guns is an unpleasant surprise for the British, especially after the German trenches had been given a good pounding by their artillery. But the Germans have developed new tactics. Instead of placing machine guns in their trenches, where they will be a target for British artillery, they have started to locate them in shell holes in No-Man’s-Land. When British troops advance, they are not attacking a line but entering a zone of death. The United States of America remains neutral, sitting out the war that is engulfing Europe and spreading its tentacles to the rest of the world. Yet American manufacturers are happy to profit from the war, with munitions producers selling to anyone who will buy their deadly wares. However, the British naval blockade of Germany means that only the Allies are able to buy American arms. This irks the Germans. It means that as well as fighting the Allied armies they are also fighting American industry. To try and interdict the flow of arms to the Allies, Germany sends secret agents to disrupt the American munitions trade. Black Tom Island lies in New York Bay, near Liberty Island and close to Jersey City. It is a major centre of the arms trade, with vast amounts of explosive materials stored here waiting trans-shipment. Shortly after midnight today guards discover several small fires on the pier. Some of the guards flee in terror, while others attempts to fight the fires and call the Jersey City fire brigade. But the fires cannot be contained. Shortly after 2.00 a.m. they reach the explosives. Around a thousand tonnes of TNT detonate. The blast registers at over 5.0 on the Richter Scale and is felt as far away as Maryland. Thousands of window panes shatter in lower Manhattan. Only seven people are killed, though several hundred are injured. Property damage is enormous, with the Statue of Liberty alone suffering some $100,000 worth. Suspicions begin to arise that this huge explosion might be the result of sabotage. Could German agents be responsible, perhaps working in league with supporters of Irish and Indian independence? As the war rages across Europe, Switzerland remains an oasis of tranquility. The mountainous country is surrounded by belligerent nations but has managed to escape the destructive madness. Switzerland has become a haven for those seeking to escape the war, particularly artists, pacifists and people of eccentric political opinions who want to avoid conscription into the armies of their homelands. Zurich is the base for many of these exiles. Here one finds the Russian socialist Vladimir Lenin, the Irish writer James Joyce, the Franco-Romanian artist and essayist Tristan Tzara and the German author and poet Hugo Ball, amongst many others. Not all of these figures would have known or approved of each other, but Tzara and Ball are part of the same circle. They are habitués of the Cabaret Voltaire nightclub, a night club for artistic, also the base of the Franco-German painter and poet Hans/Jean Arp and the Swiss artist and dancer Sophie Taeuber. The Cabaret Voltaire is the scene of bizarre performances by the various writers and artists who frequent it. Their experimental work is like nothing previously seen, an avant-garde reaction to the madness engulfing Europe. Their movement begins to acquire a name: Dada. The word is deliberately meaningless, yet it is also the first word said by infants learning to speak. Hugo Ball has already started editing the Dada journal. Tonight in the Cabaret Voltaire he delivers the Dada Manifesto. Or maybe he delivered it somewhere else two weeks ago. Dada is hard to pin down. The manifesto is largely meaningless, which may be the point, but in a continent destroying itself no one can accuse the artists of being mad fools. Note: I am not sure where the Cabaret Voltaire videos originally come from but as there was no sound cinema in 1916 they must be reconstructions after the fact. Charles Fryatt is a British sailor, the captain of the Brussels, a civilian steamer. In March of 1915 while sailing in the Norths Sea his ship was ordered to stop by a German U-boat. Fryatt disobeyed this order, instead ordering his ship to raise steam and sail towards the U-boat at full speed. The U-boat managed to submerge before Fryatt could ram it. The Brussels made its escape and in recognition of his actions Fryatt was awarded a gold watch by the Admiralty. Last month while sailing by night from the Hook of Holland to Harwich the Brussels was ambushed by German destroyers. They forced it to sail with them to their base at Zeebrugge in occupied Belgium. Fryatt and his crew are interned in Bruges. Today the Germans court-martial Fryatt for attempting to ram the U-boat last year. They argue that, as a civilian, he has no right to be engaging in military action. By trying to ram a U-boat he has become nothing more than a franc-tireur, operating outside the protection of law. The trial is short. The court finds Fryatt guilty and sentences him to death. The Kaisers himself confirms the sentence. Fryatt is executed at 7.00 pm by firing squad. Fighting at the Somme has become localised, with troops fighting and dying to secure tiny pockets of ground. One such place is Delville Wood, beside the village of Longueval. South African troops entered the woods earlier in the month but were unable to secure it. Since then it has been the scene of savage fighting as the South Africans and British tried to clear the woods of the enemy while German counter-attacks attempted to expel the Allies and return it to their control. Today though British troops launch a determined assault to secure the woods. Their attack is preceded by an artillery bombardment so devastating that it shatters the surviving Germans’ ability to resist. The British at last manage to secure Delville Wood. In London the British government are becoming concerned about the progress of the Battle of the Somme. They are seeing casualty lists becoming ever longer, with no sign that major gains are being made against the enemy. Haig is aware of the government’s concerns, but the British army’s Western Front commander continues to believe that victory is near at hand. He reckons that he just needs six weeks more of “steady offensive pressure” to break the Germans. In Galicia Brusilov’s offensive against the Austro-Hungarians continues. After spectacular successes, the Russians are beginning to run out of steam as exhaustion and casualties make it harder for them to maintain the pressure on the enemy. Meanwhile the ranks of their enemies are being stiffened by Austro-Hungarian and German reinforcements. Brusilov had always argued that the way to defeat the enemy was to follow his offensive with others elsewhere. That way the Germans would find it hard to concentrate their reserves against one threat. His commanders had accepted this plan and ordered Evert to attack the Germans to Brusilov’s north. However Evert’s efforts have been lacklustre. His men have attacked in the traditional Russian human wave assaults and have suffered terrible casualties for no great gains. What territory has been seized has mostly been lost to German counter-attacks. Now Evert sends his men forward again, in another attempt to smash through the German defences. But again, despite a great numerical advantage his men make little or no progress but add to their already extensive casualty list. Yesterday the British launched a major attack on the Somme, which met with little success. One exception was an attack by Australian and British forces towards the village of Pozières. Thanks to an intense artillery bombardment and clever use of a creeping barrage, the Australians managed to punch through the German lines and seize the village. The Germans are determined to recapture Pozières. Several counter-attacks yesterday were defeated, but today they attack with an entire division. By now however the Australians have brought forward machine guns. The advancing Germans are decimated in fighting that is like a reverse version of that seen on the first day of the battle. So the Germans change tack. Accepting that they will not be able to storm Pozières, they decide to make it uninhabitable for the Australians. A murderous artillery barrage is directed down on the village. Pozières is to be continuously shelled until its defenders are all killed or forced to withdraw.